Greenlight, a muni FTTH network in eastern North Carolina's city of Wilson, is proving to be a powerful tool in attracting new residents and businesses. We spoke with General Manager Will Aycock about the network and how it has benefited the community. Our interview covers a number of subjects, including how the network is attracting new residents to the area and helping businesses to be more competitive in part by providing an incredibly reliable product - more than five years without an outage to its major commercial subscribers. The schools in the entire County are connected, allowing them to take advantage of all major technological innovations. First responders, especially fire fighters, are better able to train and respond to incidents because of benefits from the fiber network. All this and more in the audio below. We previously published a case study of Wilson's Greenlight and also wrote about how Time Warner Cable responded to the network by lobbying for a law to make sure no other community could copy Wilson. And last year, we interviewed Catharine Rice about that law in episode 5 of this series. 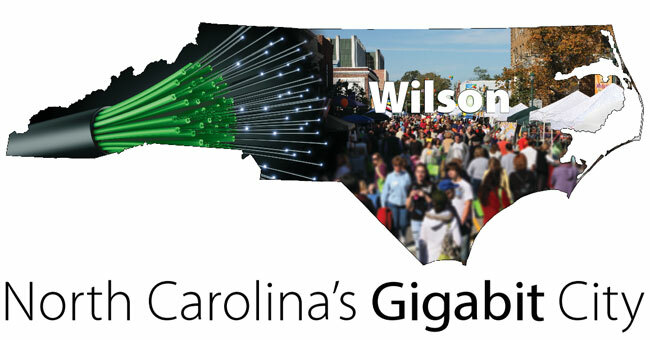 In North Carolina, Wilson's Greenlight will begin offering gigabit residential services as early as July. Greenlight began offering FTTH service since 2008 to businesses and households and now provides affordable and reliable triple play. Along the journey, Greenlight faced a playing field tilted in favor of incumbent providers, predatory behavior from those incumbents, and dangerous legislative barriers created by companies like Time Warner Cable and CenturyLink. Greenlight currently serves approximately 6,000 customers in Wilson and provides service to schools throughout the larger county. The network provides free downtown Wi-Fi through the downtown area. In late 2006, Wilson, North Carolina, voted to build a Fiber-­‐to-­‐the-­‐Home network. Wilson’s decision came after attempts to work with Time Warner Cable and EMBARQ (now CenturyLink) to improve local connectivity failed. Wilson’s decision and resulting network was recently examined in a case study by Todd O’Boyle of Common Cause and ILSR's Christopher Mitchell titled Carolina’s Connected Community: Wilson Gives Greenlight to Fast Internet. This new report picks up with Wilson’s legacy: an intense multiyear lobbying campaign by Time Warner Cable, AT&T, CenturyLink, and others to bar communities from building their own networks. The report examines how millions of political dollars bought restrictions in the state that will propagate private monopolies rather than serve North Carolinians. These companies can and do try year after year to create barriers to community-­‐owned networks. They only have to succeed once; because of their lobbying power, they have near limitless power to stop future bills that would restore local authority. Unfortunately, success means more obstacles and less economic development for residents and businesses in North Carolina and other places where broadband accessibility is tragically low. It certainly makes sense for these big companies to want to limit local authority to build next-­‐generation networks. What remains puzzling is why any state legislature would want to limit the ability of a community to build a network to improve educational outcomes, create new jobs, and give both residents and businesses more choices for an essential service. This decision should be made by those that have to feel the consequences—for better and for worse. Update: You can also watch the video over at the Huffington Post, in our first post as a HuffPo blogger. While we were battling Time Warner Cable to preserve local authority in North Carolina, we developed a video comparing community fiber networks to incumbent DSL and cable networks to demonstration the incredible superiority of community networks. We have updated the video for a national audience rather than a North Carolina-specific approach because community fiber networks around the country are similarly superior to incumbent offerings. And community networks around the country are threatened by massive corporations lobbying them out of existence in state legislatures. Feel free to send feedback - especially suggestions for improvement - to broadband@muninetworks.org. On Wednesday morning, March 22, the House Finance Committee will again consider H 129, a bill from Time Warner Cable to make it all but impossible for communities to build their own broadband networks. But now, as noted by Craig Settles, the momentum is shifting. Last week, advocates had a big victory when Representatives Faison and Warren successfully amended the bill (each with his own amendment) to make it less deleterious to communities. Unlike the sham voice vote in the Public Utility Committee, Chairman Setzer of the Finance Committee had a recorded vote, allowing citizens to hold their representatives accountable. After these amendments passed, the TWC lobbyist signaled for an aide. Shortly thereafter, the committee decided to table the matter until this week -- when TWC will undoubtedly try to remove or nullify those amendments. In the meantime, AT&T has announced bandwidth caps, yet another reason the state is foolish to pin its broadband future on cable and DSL companies. Compare AT&T's movement to less-broadband with Wilson Greenlight's recent dramatic price decreases in its ridiculously fast broadband network, causing at least one couple to move there! Greenlight is owned and operated by the public power company owned by the city. Greenlight has signed up its first residential customers with the highest Internet speed available in Wilson. Vince and Linda Worthington, former Johnston County residents, moved to Wilson after finding out that they could have access to 40 Megabits per second Internet speeds at a lower cost than what they were previously paying. On Wednesday, the bill to effectively ban community networks in North Carolina was passed out of the House Public Utilities Committee and will likely be heard by the Finance committee next week. The audio is available here from the Wednesday meeting [mp3, 45 min]. It never fails to shock me how cavalierly some Committees refuse to discuss the bill, agreeing to let another Committee fundamentally change the bill. There is practically no discussion of what this bill does and very little discussion about the actual pros and cons of different approaches to providing broadband. Listening to the discussion, one gets the distinct impression that a household either has "broadband" or doesn't. There is no discussion of the known failure of the private sector to invest in next-generation networks. If I were a Representative in North Carolina, I would be sure to ask why no private sector provider is building next-generation fiber-optic networks like those in Wilson, Salisbury, and hundreds of communities served by Verizon's FiOS outside the state. There is no discussion of the wisdom of relying on last-century cable and copper networks. Those pushing this bill have no idea what they are doing. They may gut the potential for full fiber-optic networks in the state as the rest of the world charges forward building these networks. They are defending the horse-and-buggy industry in the age of automobiles. This is a good 5 minute interview discussing what Wilson has done to build the first citywide FTTH network in North Carolina. Greenlight has a business customer taking 1Gbps -- something that would undoubtedly have been totally cost-prohibitive (and possibly just unavailable) if the City had not made its broadband infrastructure investment. Toward the end, Brian Bowman is asked if he recommends all communities build a similar network. His answer is very wise: all communities should have the right to do it and they should decide for themselves based on their situation. That is our position as well.